Honey Nut Praline is a delicious mix of sweet honey, buttery nuts, and toasted praline undertones. If you like the sweetness of honey and the roasted flavor of nuts, the merging of flavor will have your taste buds melting in this full-bodied cup. With only 2 calories per cup, the Honey Nut Praline is made with 100% Arabica beans that feature a fresh roasted flavor bursting with sweetness. A heat-sealed valve bag will ensure the freshest coffee possible, which is why this Honey Nut Praline will be fresh roasted and shipped on the same day. 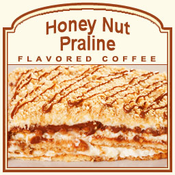 If you like honey in your coffee or tea, the sweetness from this Honey Nut Praline flavored coffee will be the perfect addition to any morning!